While some video games don't age well, playing through Nintendo's back catalogue is like drinking a fine, aged wine. Super Mario Advance is rather unique in that it's a re-release of a collection of remade NES games. Super Mario Advance's brightly coloured remakes of Super Mario Bros. 2 and Mario Bros. shine on the Wii U GamePad — their tried-and-true gameplay is as fun as always — but they've both been released on so many platforms over the years that gamers should decide beforehand whether or not the new paint job (and occasional extra features) are enough to justify the premium Virtual Console price. Super Mario Bros. 2 is the main attraction in Super Mario Advance, which is a curious choice given the game's odd place in the Mario canon. 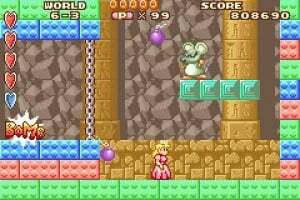 Following the Japanese release of the original Super Mario Bros. 2 — later released as The Lost Levels — Nintendo executives feared it would be too difficult for western audiences and decided to re-skin a different game, Doki Doki Panic, with Mario characters. A slower, more puzzle-oriented adventure, Super Mario Bros. 2 features large levels with hidden doors and secret areas. 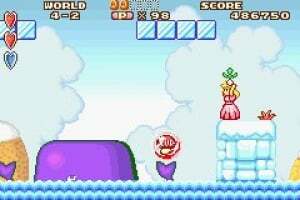 Players can choose to play as Mario, Luigi, Toad, or Princess Peach (renamed from Princess Toadstool, her NES name), and characters have the same basic move set of jumping, picking up enemies and throwing items; yet each control slightly differently. Mario is the easiest character to play with, Luigi can jump slightly higher, Peach can jump the farthest and Toad is the most lightweight. These features should be familiar to anyone who's played a Mario game in recent years — Super Mario 3D World uses the same principles — but it's interesting to see the origins of these distinct strengths per character. Players will also witness the first appearance of recurring Mario enemies, such as Shy Guy and Birdo. The game did undergo some modern updates for the GBA release. Nintendo added a point system, as well as several collectibles to find throughout each stage. Super Mario Bros. 2 is not a particularly difficult game, and with the Virtual Console's save state system players should have no trouble completing it in a short amount of time. There are a few secrets to uncover, extending the experience, and playing through with each character feels slightly different. 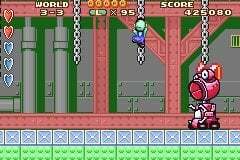 The other included game in Super Mario Advance is a remake of the original Mario Bros. This simple game sees Mario tasked with eliminating all enemies in a vertical stage. To do so, he first needs to knock the enemy out of commission by hitting the platform they're on, knocking them onto their back, then run into them. The intentionally floaty controls make this quite a challenge; Mario's jump is quite different than in subsequent follow-ups. There are also POW blocks that knock several enemies onto their backs at once, while each stage adds more enemy types, as well as hazards such as fireballs. Mario Bros. is a tough game, but fans of the NES Remix series should have no trouble jumping in. Nintendo designed Super Mario Advance with a singular art style. Sprites are large and colourful in both games, and iconic tunes are remixed. There are also a few modern Mario sound effects sprinkled in. The game is nice to look at and listen to, but it's standard Nintendo fare and won't wow anyone. 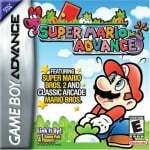 Super Mario Advance contains two historic games at a reasonable price. The downside is that many Nintendo fans have played these games already. The few additions don't do enough to make it a "new" experience, but the titles on offer are decent and stand on their own; this is best recommended to gamers who aren't already schooled in classic Mario. The original NES version is a lot more charming in my opinion. I'd rather play that one. Same with SMB3. This was one of my first games so I'll be downloading this sometimes soon since the visuals are far more attractive than the originals' and because of my nostalgia. I was lucky enough to have all of the "Super Mario Advance" series of games within my childhood. Loved them all, I can safely say this game is the reason why I'm OK with SMB2 today. By all means, give this game a go if you've yet to play the original. @NintyMan - Whoa, really? I didn't know he did most of the voices. They sound so different! Now all that's left is for Nintendo to give us DokiDoki Panic. I've played an import copy once, and while the differences are cosmetical, it's an interesting experience nonetheless. @Giygas_95 Problem is the NES emulator doesn't work properly (The GBA one is great). @Nintyman "This is as far as you go!" made me cry with laughter. Literally. Almost every time. The birdos were terribly voiced, perhaps they should have got Charles to voice them aswell? @unrandomsam I'd you're talking about the side of the screen in SMB3, that was there in the original, so it's not a bug in the emulator. It's a shame SMB 1 didn't see a GBA release, as the trilogy seemed a bit incomplete this way. But still, a nice version of a classic title. @NintyMan Bahaha, thanks for reminding me of that too! Seems like I'm gonna have to download this and play it through again for sheer giggles alone. And you, you'll, same difference! SNES I compared Super Mario World (Super Famicom cart / Wii VC / bsnes / Wii U VC). Ignoring the awful filter. bsnes or the cart are fine. Wii VC is not quite right but not that different. Wii U VC is wrong. (Connecting to a CRT doesn't make any difference). Bleh. I love Mario Bros. and all, but... yeah. This was the first gameboy advance game I bought. I was in Singapore with the Marines and walked into a Toys R Us and saw the Gameboy Advance. At the time I was blown away as the gameboy had been out forever and the Advance hadn't even been talked about in the States back in 2001. I loved this, even though half the menus were in Japanese(which I don't speak). My first GBA game right here. I may pick this up. Ah, my favorite version of Super Mario Bros 2 and I didn't even know it was coming to the eShop yet. Downloading this asap! Giant enemies, vegetables, lots of chances for 1ups and extra hearts. Unlike the original, you're not stuck with the same character throughout the entire stage as you can select a different player when/if you die. Honestly, the SMB2 GBA remake is far more accessible IMO than the original. If you struggled with SMB2 NES, pick this one up. The only reason I'm glad they're releasing these is that I hope it means the DKC GBA games will get the same release treatment. Still, I much prefer the NES original. The nes music renditions, SFX and 8-bit sprites suited it better. Also, Yoshi does not fit in in Subcon dream universe imo. I liked the little thrown in additional features in SMB2, but they were nothing special. I agree. The NES version is a lot more charming and ultimately is the best version to play. 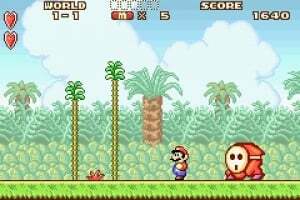 The music, SFX and 8-bit visuals are far more favorable then the All-Stars advance versions which, i i remember correctly recycle certain SFX from Super Mario world....This version just doesn't convey the same magic, look and feel as the original. This was my first GBA game, so it holds a special place in my wittle wavey heart, but I'd take the NES original over this in a Stacey Q heart beat. I would've liked to hear more about the differences compared to the All-Stars version! All-Stars>GBA version. First because of the Points, the light sprites, some bad gameplay changes and the horrible voice acting are making me turn away from this game. This is as far as you go! 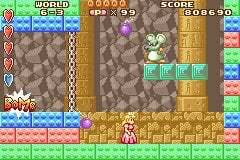 I'd love to see SNES's Super Mario Bros. All-Stars come to Wii U VC. Really 3DS VC would be preferable but, yeah like they'll ever give us that. This one doesn't appeal to me since I've played the original so much. All-Stars at least looked a lot different from the originals. It's probably because of my nostalgia, but I prefer this version over the NES version anyday. The NES version just looks bland in terms of graphics, and the SNES version is missing some of the improvements seen in this one. The NES version is cheaper and more what I remember as a kid anyway. I think I'll pick that up. Would be cool if they released Mario All Stars as a WiiU VC title though. When is the European version coming? @unrandomsam How do you mean? 7? Wow. I thought this was a great game, same for all the other Mario Advance games.